Why rent a lighting system? If you are staging an event that happens annually, or even quaterly, it becomes hard to justify the purchase of certain technological necessities for putting together a successful event. Likewise, renting equipment from the venue in which you will have your event can also be pricy. A Tech Travel Agent however, can get you the technology you need for your event at a fraction of the cost of purchasing or renting from the venue, including delivery and installation of your lighting system rental. In addtion to lighting for events and stages, a Tech Travel Agent can also get you lighting for filming purposes, a purpose which is obviously temporary. Get a rental quote for a lighting system! Having the right light for your stage or film is crucial to having either a visual impressive stage or a professional grade film. Even if you have professional grade cameras for filming, if the light that you are filming in is of poor quality, then so will the finished film; editors can only work with what the cameras give them. Likewise, if your sound system sounds great at your event, but there is no dynamic lighting, then your stage presentation at best will be mediocre. In either situation, lighting is crucial, and our Tech Travel Agents can get you the right kind of lighting system with on-site delivery and installation! The Arri kit is a very versatile lighting package, and can be custom configured for your needs specifically with various wattages and stand types. In addition to offering a variety of wattages, a variety of light diffusion materials also come with the package, which is ideal for filming. 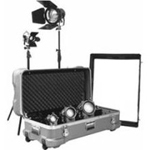 Get a rental quote on an Arri Light Kit! Whether hosting a corporate-wide party, or a very large personal gathering, the crowd needs to be entertained. Having a dynamic lighting configuration to augment the musical experience had at a party is invaluable to keeping guests stimulated. So contact your Tech Travel Agent to get the right kind of lighting system for your big party. If you are putting on a show or concert at a given venue, and need more or better lighting than the venue has to offer, you should contact a Tech Travel Agent. We can get the right kind of lights and lighting system to suit your needs, so that you can blow your audience away visually.